Quantity Sold as a set of 6. 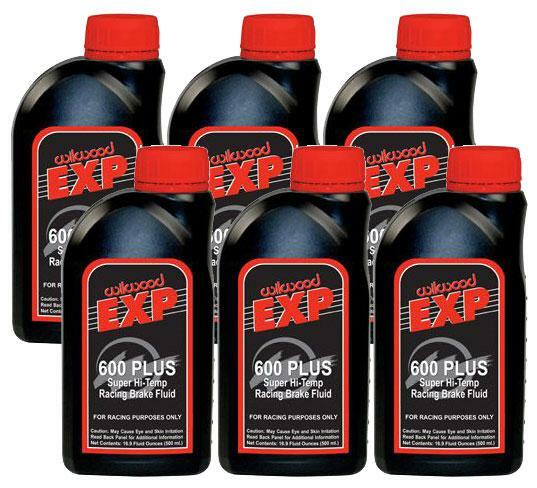 EXP 600 Plus is a highly refined blend developed for extreme performance under the high heat and extreme pressure of professional motorsports.EXP 600 Plus has tested to 626 degrees Fahrenheit with a wet boiling point of 417 degrees Fahrenheit. These numbers far exceed any DOT or SAE specifications. It is true that racing fluids need to have high boiling points. It is also true that fluids need to have low moisture affinity to slow the natural absorption rate of water vapor. But the true test of any fluid is how well it resists aeration and compressibility after it has been heated and pressure cycled a few hundred times. The real test is at the track. EXP has been proven to maintain firm pedal feel and quick response, long after others have failed. Wilwood?s specially formulated Hi-Temp? 570 Racing Brake Fluid has a minimum 570? F. dry boiling point of to withstand the severe heat requirements of automotive racing. Hi-Temp? 570?s low viscosity allows easy bleeding of your brake system, eliminating aeration of the brake fluid caused by foaming due to excessive pumping of the pedal. Hi-Temp? 570 comes in convenient 12 ounce containers hermetically sealed to guarantee against unwanted absorption of moisture which can drastically lower the fluids boiling point (fluid from larger containers tends to become contaminated with moisture, lowering its boiling point and making it unsuitable for racing applications. Wilwood FIVE is a highly refined silicone brake fluid, formulated to preserve the looks and reliability on classic vehicles and show cars. Its non-hygroscopic blend blocks moisture absorption to inhibit internal system corrosion. It is paint friendly and will not harm most custom finishes should a spill or leak occur. Wilwood FIVE provides superior lubrication for all brake system wear surfaces with long life from the master cylinder and caliper pistons, bores, and seals. It is a fully DOT 5 compliant fluid meeting or exceeding FMVSS 116 and MIL-PRF-46176B-DOT specifications, and can be used in any vehicle that is OE specified for DOT 5 use. Wilwood does not recommend using DOT 5 fluid in any racing applications. Wilwood?s specially formulated Synthetic Assembly Lubricant is designed to be used on pistons and rubber components when overhauling brake calipers, wheel cylinders and master cylinders for maximum protection and performance. Comes in a convienient 4oz bottle size, with applicator tip. Also available in a case of 12 ? 4oz bottles. Best pricing I found anywhere on the part I needed, quick shipping, no hassle. Definitely going to be a repeat customer. Installed a 5th wheel hitch in a F150 with a 5 1/2' bed. Autoplicity had the Sidewinder hitch I needed to put the swivel under the camper insead of at the hitch,also at a lower price than competitors with extremly reasonable shipping $14.38. I Placed the order on a Friday and the item shipped the same day. Very happy with the product and fast shipping. Autoplicity had an item my vendor had on backorder for weeks in stock and shipped it very quickly. I'm glad i found this place on the web, and will be looking forward to doing business with them in the future! SUPER EASY TO ORDER, CHEAPEST PRICES!! WILL BE ORDERING FROM THEM AGAIN! Excellent service and the cheapest price that I could find anywhere. Ordered on a Sunday and delivered in record time three days later...basic overground shipping. I will deffinately order from here again! had what I wanted in stock for the best price possible! Was delivered within days! Good goin Autoplicity!